A quality FPS gaming mouse, with superb tracking abilities. 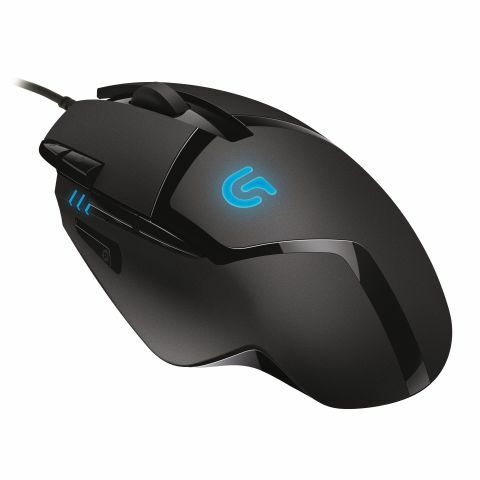 However disgruntled I'm becoming about the amount of gaming hardware being named after classical Greek characters, I have to admit to being seriously impressed by the latest Logitech mouse. It's being marketed as 'the world's fastest gaming mouse' and to be fair Logitech have got a point. It's not trading on the sort of crazy-high DPI settings it's bigger sibling, the G502 Proteus Core, can manage, but it's capable of tracking your movements however quickly you hurl your rodent around the desktop. The G502 is able to hit a maximum DPI of some 12,000, while the G402 is seemingly lagging behind at a leisurely 4,000 DPI. That doesn't sound quick, but sensitivity does not equate to tracking speed. And that's where the G402 can claim dominion over pretty much anything else out there. The Hyperion Fury can track movements up to around 500 inches-per-second (ips) while the quickest you'll generally find in high-spec mice like the G502 is something in the region of 300ips. How is it doing such voodoo? Well, it's all down to the Fusion Engine hybrid sensor Logitech has placed at the heart of the G402. Normal gaming mice use optical sensors to keep track of their movement across a given surface, but if you make sudden movements the sensor can lose track of where it is and you lose accuracy and consistency in-game. Logitech's way around this is to add an accelerometer and gyroscope into the Fusion Engine, all plugged into a 32-bit ARM core. That means even if the optical laser sensor loses its bearings the accelerometer and gyroscope are able to predict, impressively precisely, where the mouse is moving. All this means the G402 offers one of the most consistently accurate FPS gaming experiences you'll find. Name aside, what I'm not massively sold on are the more cosmetic features of the G402. The long thin grip would be fine if it shared the G502's thumb rest, allowing us claw-grip gamers a more comfortable hold. I'd also like to see the geared scroll wheel of its big brother. Inevitably when I'm talking about a Logitech mouse, though, I'm going to give a shout out to the beautiful G9, and beg them to see if they can stick a Fusion Engine into their old chassis. But personal issues aside, the G402 is an excellent FPS gaming mouse. It will consistently keep track of any speedy movement up to, and possibly including, hurling it across the room in a fit of gaming pique.